Comprised of a study spanning over five years, this text looks at four engineering co-op students as they write at work. Since the contributors have a foot in both worlds -- work and school -- the book should appeal to people who are interested in how students learn to write as well as people who are interested in what writing at work is like. 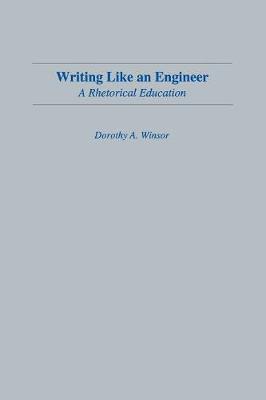 Primarily concerned with whether engineers see their writing as rhetorical or persuasive, the study attempts to describe the students' changing understanding of what it is they do when they write. * the hierarchical structure of the organizations in which engineering is most commonly done. Both of these features discourage an open recognition of persuasion. Finally, the study shows that the four co-op students learned most of what they knew about writing at work by engaging in situated practice in the workplace, rather than by attending formal classes.